The gentle lute is an ideal instrument for late night listening (likewise my own, the clavichord). I have always played CDs of both at reduced volume, as often recommended. 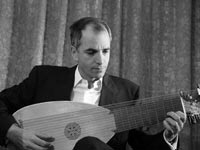 Rolf Lislevand takes an opposite view, describing the confined space in which lute music was usually heard - and try to emphasise to listeners that the clavichord too commands a huge dynamic range, albeit at low decibel levels). This 17th music is treasurable and lovingly played by both lutenists, Pernot's at Thun, 1989 (I had the pleasure of attending his Accord launch recital in Paris*) and Lislevand's very new CD in Maguelone Abbey in April 2003. 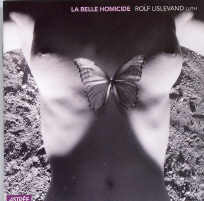 The only overlap is the strangely entitled piece La Belle Homicide by the younger cousin, Denis. Its title denotes the sweet metaphorical 'homicide' of love, this favourite piece beloved at the time and copied into more than ten different manuscripts, studied by these scholar lutenists. Ennemond Gaultier was court lutist to Marie de Medicis but his cousin appears to have had no official position. Denis Gaultier made his collection for a (male) patron, Anne de Chambre. His style is said to characteristically 'treat melody as song', whereas Gaultier the Elder's 'flows more freely, is not so polished but perhaps is more inventive'. For non-specialists it will be hard to individuate the many composers in Lislevand's selection, and best not to worry too much. His is the more atmospheric recording, engineered with just enough resonance to give warmth, which suits is rather romanticised attitude to the lute repertoire and to playing his instrument; his groups are introduced by evocative sounds of the countryside; he recorded at night and 'made no effort to eliminate the night songs of French frogs, ducks and birds'. Both collections are highly desirable - the Accord double-CD may be harder to trace - and both are well recorded and documented, making fascinating reading and not only for specialists. Explore and enjoy! 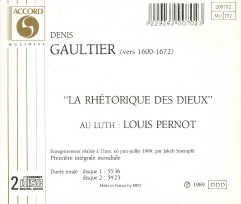 * See Luis Pernot playing Gaultier on YouTube; I heard Pernot in Paris (& had supper with him afterwards) at a time when he was retiring from playing & taking Holy Orders? Maybe he has combined both vocations? 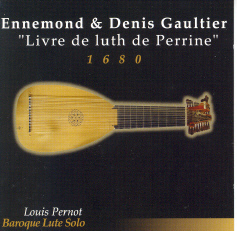 Fifteen years on, Louis Pernot has recorded more lute music from his specialism, 17th century France. Most of the pieces here are by Ennemond the elder of the famous Gaultier cousins, who was immensely famous and more inventive than Denis, with 'a certain roughness' and 'of such density that every note is important'. Pernot has been recorded again in Thun, Switzerland (February 2004) and as before by Jacob Staempfli, chief engineer of Accord in the '80s and bass (I have his 1982 recording of Winterreise). The sound (unnamed venue) is fine, but Ad Hoc records has not been able to match the lavish documentation of the Accord double-CD. 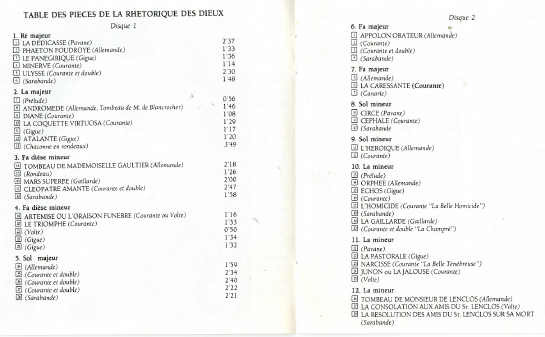 Both lutenists' recordings recommended without reservation.